Student debt is one of our country’s most pressing problems. As of this year, the total amount of student loan debt has reached $1.44 trillion. Paying back the average $37,000-plus loan will be a challenge for millions of students for decades to come. And for some more than others. This means that loan borrowers will have to focus less on investing and more on repayment, less on contributing to the economy and more on simply balancing budgets. To be responsible and to flourish do not always coincide. Larger cities with higher housing costs will drain more income from a person than smaller towns, while yet offering unique opportunities and venues that attract younger crowds. It’s a classic catch-22. More, perhaps higher-paying, jobs are in the cities, and so are, quite likely, friends and opportunities. Should a young person, with their whole life ahead of them, forgo the city to repay steep student debt, while in the long-term stifling their social life and career? Credible.com has helped us answer this question in some form: by compiling a list of “Cities where student loan borrowers struggle with debt the most.” Maybe the answer isn’t to forsake the city in general, but only certain cities that have the unfortunate characteristic of demanding higher housing costs without proportionately offering higher wages. To compile their list, the team at Credible reviewed data submitted by 8,981 applicants from America’s 23 largest cities. The city that makes it most difficult to repay a student loan is San Jose, California, seizing on average 31.47% of a person’s monthly income in housing and student loan costs. This percentage doesn’t include other expenses like food, transportation, or taxes. What might come as a surprise to many, Dallas, Texas, ranked least expensive among the top 23 cities, nabbing 26.24% of income. The full list may be found here. Perhaps the question isn’t whether to move to a city, but in which city one might sustainably live. As student loans are one of the few forms of debt that are essentially impossible to dissolve by bankruptcy, they are here to stay. 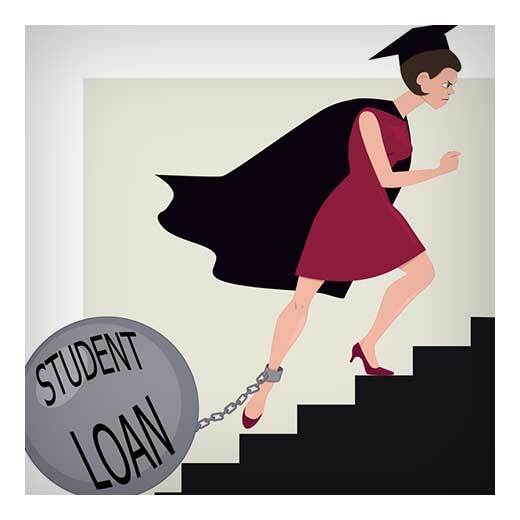 The road that leads directly to a good life, debt free, full of friends and possibilities, isn’t clear to student loan borrowers at this point. However, thanks to the new study by Credible.com, it’s easier to discern which steps one may take to begin the journey.